About 5 years ago I discovered the joy of running. At first it was all about fitness as I was terribly out of shape and looking to lose some weight. By the second or third year however it became more about my passion for the sport, the love of the outdoors and the desire to be in the sunshine on anything from a crisp April morning to a sweltering July afternoon. While my running evolved over the first four years, one thing stayed the same. I did not run in the winter. Something about the temperatures dipping below 5C just turned me right off the sport and had me indoors until the following spring. This winter, however, I was able to put that behind me and run right into the depths of January and February. This new found love of cold weather activity sparked a new interest which made use of the snowy, slippery terrain; snow shoeing. It started by chance. Early in the winter a buddy had bugged me to try cross-country skiing with him. I did... and I hated it. I had trouble staying on my feet and even when I could I must have looked like a drunk flamingo. He saw my struggles and recommended we try something with a lesser learning curve for the rest of the afternoon, so we strapped on some snow shoes and headed for the trail. Fast forward two months and I now own my own pair of snow shoes (Atlas 9-series), and have been out on many adventures both back-trail and urban. My first big run was High Falls trail in the southern tip of Algonquin Park's panhandle. Great views of a mostly frozen river/waterfall and beautiful forest scenery. Algonquin is one of my favourite places to visit, and the snowy winter setting puts a fresh spin on it. Not being able to 'get away' every weekend however has forced me to track down some great urban snow shoeing. I explored the parklands of my own neighbourhood here in Mississauga and while there were no wild life sightings, I had myself a great view of a passing GO Train. I feel as though you don't really know even your own neighbourhood unless it is explored outside of a car. In the summer this can be done on a bike or even on foot, but in the winter time snow shoeing is a fantastic option. Many chilly Sunday mornings have been spent with my father-in-law in Brampton trekking across several city parks. We cruise through thick powdery snow that boots alone wouldn't dream of, passing by small half-frozen duck-filled ponds. These trips even include a bit of urban exploration checking out an abandoned highway overpass which had been decommissioned since the closing of a quarry many years earlier. 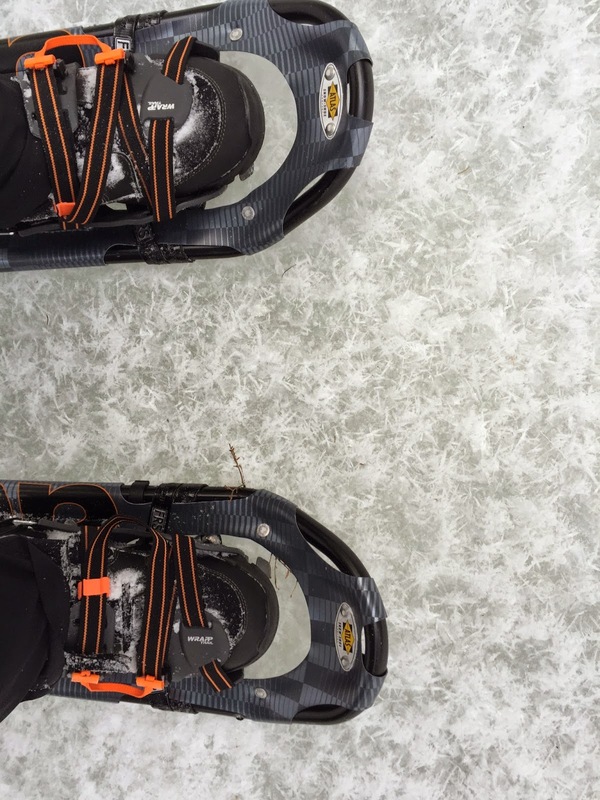 While snow shoeing doesn't offer the adrenaline of snowboarding or downhill skiing, it is a great (affordable!) 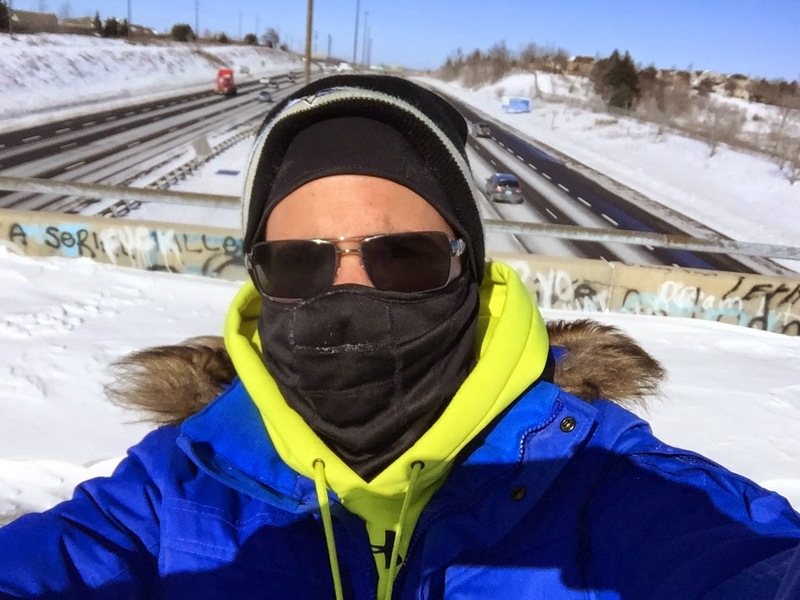 winter sport for those looking to explore nature, see their own local park from a new perspective or even just keep up with that outdoor cardio in the harsh Canadian winter. Just remember to layer up! Note - For those who like to track progress I highly recommend the Strava app/site. It is great for running, cycling and even has an option to track other types of movement like snow shoeing.